If you have read our History of Slot Machines article, you will see that the slots have gone a long way since the Liberty Bell developed by Fey in San Francisco, California in the 19th century. The goal back in those days was to land a winning combination on the one and single payline in the middle of those three reels. There were no Bonus Features, No Free Spins or any facilitators that were going to make it easier for you to win some of the major prizes in the slot. Even though there were more than a hundred years of offline development and nearly two decades of online slot progress, the concept of the slot games hasn’t changed that much. It’s the same now as it was back in the days – you would need to land a winning combination of symbols on the reels to win a prize. Bonus Features are extra features, mini-games or separate screens with different gameplay but the same goal – to award more lucrative prizes to the slot player. Some games have random bonus feature activator, while others require a certain number of some specific symbols to activate them. These can be Wilds, Bonus Symbols or Scatter Symbols. Three or more scatter or wild symbols give away a payout on their own before triggering the bonus features. On the other hand, with the popularity of the slot machines, we can see that the growth of the demand and excitement of the players rises together with their number. This is where the Reel ‘Em slot from WMS Industries comes into play, a slot that we have explained in our History of Slots article once again. WMS Industries were the first ones to include a Bonus Feature in their play and they implement it in their Reel ‘Em, an online slot game. The UK fruit machines had a bonus feature as long as they existed, and the majority of the prize of those fruit machines came from the bonus features as well. Many of the Online Slot Machines nowadays have at least one bonus feature. The popular ones may include even more, and we have seen some games with up to five bonus features. The paytables play a major role in the bonus features, and you can see what bonus features the game has if you click on the paytables button or check our game review, where we have the bonus features explained in a bit more details. Many online games have a random bonus feature during their base game. They can appear randomly or with a certain combination that you will land on the screen to award prizes or free spins. The Click me or Instant Win Bonuses are awarded when you manage to land three or more of the scatter or any other symbol that is determined by the game from left to right. When that happens, the player might be taken to another screen or stay on the same screen and pick a certain number of the mysterious items that are offered by the Game Providers. After revealing the prizes, you will be taken back to the base game screen with the prize from the bonus feature added to the stake. Note that there might be a multiplier at the end of the bonus features, or inside the items that will increase your chances of landing a lucrative win. The Sticky Wilds stay on the reels for the whole duration of the bonus feature. This means that with each spin there is a guaranteed wild on the reels. Each new wild that lands on the 2nd or latter spin will also remain on the reels. The Stacked Wild appear one above the other symbol and they combine and populate multiple positions or the whole reel. Some nice payouts can be expected from this feature because the paylines pass through all of the reels. This is when a certain number of wilds appear on the screen and with each spin you make, they expand on the reels, eventually appearing on the entire reel for some major prizes. One of the most famous and definitely the online slots players’ favourite bonus feature is the Free Spins feature. The most popular and latest online slots definitely have free spins in their bonus feature rooster, as you can quickly lose a lot of players if you don’t have this feature. There are different types of Free Spins, but the most common one is to land three or more of a given combination which will result in a certain number of Free Spins. The Free Spins are also one of the most rewarding bonus features, therefore they are the most favourite among the slot players, as at the end of the day nothing pays out more prizes than the free spins feature. As an addition to the free spins bonus feature, there are some Multipliers attached to it, making the experience a bright one, and doubling, quadrupling your prize or even making it x12 times better! 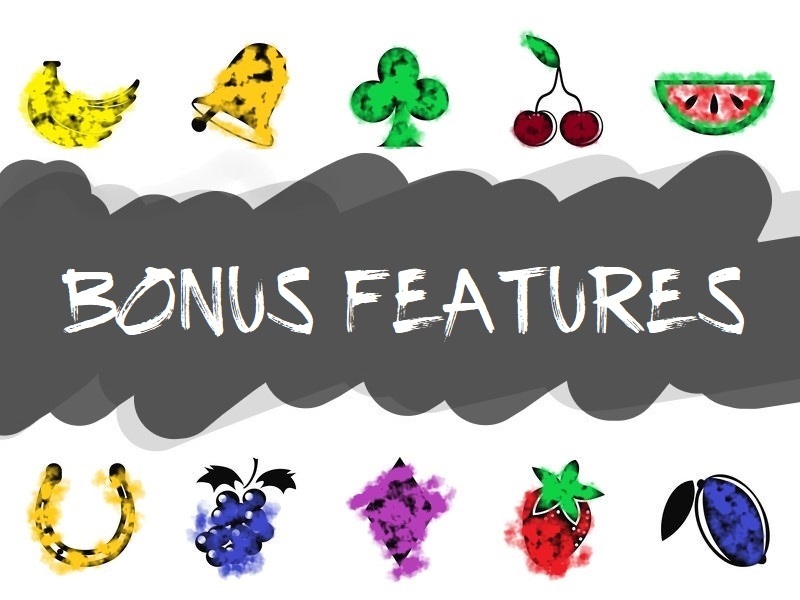 Some of the slots award bonus feature because of their special features, like the Wild Symbols, Bonus Symbols or the Scatter Symbols. They are pretty straightforward – you need to land a certain number of the given symbol on an active payline to begin and trigger the bonus feature. Depending on the game, there are many different activators, and while one of the games can satisfy with two wilds to trigger the bonus feature, other, more complex games, are activating their bonus feature when there is a scatter and a wild at the same time on the reels, or a special symbol on a given reel. The trail bonus is usually activated when there are three or more of the scatter symbols, and once that happens, the online slot machine takes the player to a new screen where there is a board game. You will either spin a wheel or roll a dice to determine the number of steps that your character will take on the board field. Along the way, you may win cash prizes, free spins or prize multipliers. Get to the end and you’ll hit the jackpot. This is a case of a really modern and not so old bonus feature that you might not have heard about. Some of the new slots have the fight round as a feature where you get to choose a fighter that will fight on your side, hopefully winning and grabbing some major prizes. The chosen fighter takes part in a fight for the jackpot, or death, whichever comes faster. There isn’t any player skill involved here, it’s just some watching and cheering from the player’s side. As an exchange of the bonus rounds and features that we are currently talking about, some slots offer multipliers to give away the lucrative prizes that the games have. They are usually located at the side of the slot, and you can’t find a Multiplier more than x5, as they all possess only x1, x2, and x3 of your wager. In the modern slot games, we can see more and more skilled mini-games that are taking part in the slot revolution. These games awake something never seen before – to have a control, even small, of the bonus feature, with their arcade and skill-based games. These bonus features use a bit more energy to get you to the online slot prizes, as you are required to aim or punch the target. The better score you have, the more lucrative your wins will be. The wheel of fortune is another bonus round that’s one of the player’s favourites but can’t be found in that many online games. We are pretty sure that you are already familiar with the Wheel of fortune and how it works, but let’s go through it shortly. The Wheel of Fortune is a wheel full of different prizes that you will spin and depending on the position of the pointer and where it lands on the reel, the slot will let you take the prize and continue playing. See these features the best in Tiki Island and Fishin’ Frenzy Slot. The gamble bonus feature is for the most passionate gamblers out there. This feature is rarely present in the slot games, and with this feature, you have the best chance of multiplying your current win or losing it completely. The Gamble Feature gets activated once you land a winning combination on the reels of a certain online slot machine. What it does is that it will take you to a new screen where you will gamble with the last win that you’ve managed to grab. The screen will consist of playing cards flipped over, and you need to guess the next card. X4 – you can quadruple your money with guessing the suit of the next card (Heart, Clover, Spade or Diamond). If you decide to play this feature, be very careful on how you manage the money, and don’t go in too far, as these kinds of games have only one winner if you go in too deep, and the winner is not you. We’ve had one customer question asking whether the bonus features are good for slot games. We got the answer, and it’s pretty straightforward – Yes! These bonus features that we’ve been taking now bring a more interesting and intense gameplay. The bonus features will most definitely give the player way more prizes and real money than the base game. The difference in the slots with or without bonus features is in the frequency and amount of payout. While the classic slot machines tend to give away less, but more frequent prizes, while the bonus features aim for a less frequent win, but the numbers are crazy. Some of the slots that we will mention below have pretty cool bonus features – take a look at them and let us know what your opinion is. Best of Luck from the Gate Slots team!